Paul Ryan laid out his vision for the Republican Party’s next four years in a morning address to the National Review Institute Summit on the future of conservatism in America. Ryan argued that Republicans should lay out their plans with even more detail now that they are the entrenched opposition. Republicans will have to oppose "big government in practice" and not just in theory, he predicted. Obamacare is no longer just a 2,000 page bill, but 12,000 pages of regulations, he said to illustrate his point. "We will have to convince the country to change course" by contrasting conservative ideas with the president’s policies, he said. "We have to show that, if given the chance, we can govern. We have the ideas." "We will win back the trust of the American people," he said. He said that the president will try to divide conservatives, especially in the House majority, but he urged conservatives to resist the potential for infighting. "We have to stay united." 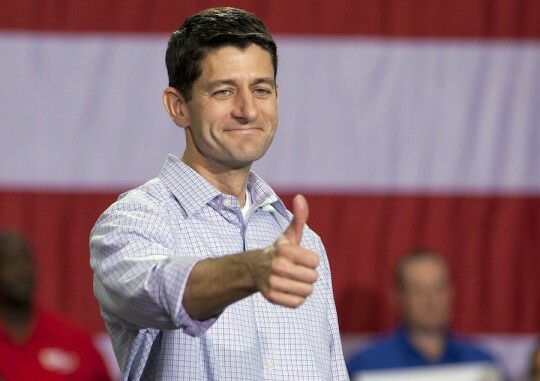 Ryan also urged Republicans to be prudent in their governance. "Prudence is good judgment in the art of governing," he said. "Our founders were men of prudence," he said. James Madison supported the Constitution despite the fact that several of his ideas were not incorporated into the final document, Ryan said. "We are the living beneficiaries of Madison’s prudence," Ryan argued. Looking at Republicans’ opportunity for policy reform, Ryan said that Republicans will have to oppose the growth of the administrative state in Washington, but the states are the "frontlines of reform." "I’m not ready to give up, and I know you’re not either," he said to the crowd, which gave him a standing ovation at the end of his remarks. This entry was posted in Politics and tagged Media, National Review Institute, Paul Ryan. Bookmark the permalink.